Woodworking Ideas, SBI and BB2. The Connection. Just like the heading states working online is not an overnight success story. There are no "get rich quick schemes" unless you are hugely talented or dishonest. Working online can be done but you have to look at it as work. If you do not want to put in the time then expect nothing to come of it. Working away at something you truly love will produce results. Satisfaction is one of the greatest rewards. Literally woodworking ideas are a great asset in creating my dollhouse website. If a person can not obtain ideas in that respect then all is literally lost. My web business is after all dependent on great ideas. So how does one come up with some dynamic woodworking topics to start with? I have been developing my site for a number of years. And really coming up with ideas would have been a problem in the past. Today, however that is not an obstacle mainly because of SBI (Site Build It). SBI does help. Inside SBI, the web hosting company I use, is housed something called Brainstorm It. I usually research a few keywords and then just begin an article concerning my choice of interest, knowledge and keyword. This process definitely helps take some of the "wonder what I'll write about today syndrome" away. If you yourself have a desire to be in business online but are concerned about how you could write enough about your passion. I was just like you. Certainly I wondered how I could write about Doll Houses over and over again. Well nowadays I do not have that worry. I just easily pick a topic and go from there. How will I ever write about my enthusiasm for doll houses to fill, one, entire page??? Presently another little known fact is: Now I have soooo many woodworking ideas to pursue I have not even begun to tap all of them!!! The Introduction to BB2... An Update! To put it quite mildly, I love BB2. The program itself is amazing and so worth the wait. Over the last nearly two months you may have noticed this website changing. We began transitioning the site to BB2 in early August. BB2 is one of the web building tools I currently use. Believe me, I am so glad that I made this move. Some of you know that I literally had to pull my site down off of the internet for a few days. If you have been around on the site you know it is now up and running as it should be. With those days all behind us. Plus one of the most enjoyable items of the move is the new Ezine name: The Minis Zine with it's new header. See above. However my site is not totally updated as I would like it to be. Yet. But never fear I am always working away at it. It is good and exciting work to be involved in. Over the next few weeks, as a result of the move to BB2, plan on still seeing some fine tuning being done to most pages. No page has been deleted permanently but plan on witnessing changes for the better. SBI, BB2 and great woodworking ideas that pertain to dollhouses are all necessary elements in creating my site. As it is now I definitely do not know how I would manage if one of those tools were missing. To Look over all Back Issues of This Ezine Check this Link..
Floorcloths have been used throughout history by the rich and the poor. Those who wanted something a little different or those who could not afford luxuries. As early as the 18th Century floorcloths for real sized homes began making their way into the decor. They were used a lot in high traffic areas to save the floors underneath. As well they became popular on stairways too. So isn't it about time to start using them in your dollhouse? Seems like a grand idea actually. I know it really isn't about woodworking ideas but it is crafty. I love crafty as well as woodworking ideas. A funny story about myself is that I used to permanently borrow tools my husband was not interested in any more. Many times he would look in my toolbox and find his whatever tool it was and say so that's where that went. Smile and walk away. So some of us ladies while crafting do like and need tools. For your Information: Clicking on any picture below will open a new window on Amazon. A list of all needed materials for this craft can be found below these idea assortments. Get stencils here or at least some great ideas and design helps. 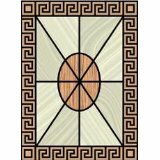 These floorcloths could go with all your other woodworking ideas in your dollhouse to make and complete amazing decor. Enhancing all your additional elements. Wash and dry canvas to take away the possibility of shrinkage. This way if you ever have to launder it your dollhouse floorcloth will remain the appropriate size where it is being used. Iron the canvas to take out the wrinkles. Decide upon your choice of scale. Measure and cut. Making sure you allow for hems on all sides. Hem all sides using contact cement by folding under your edge. Glue in place. Or if desired frayed edges make for a truly flat surface and a most unique floorcloth. Or use an over lock stitch on each side. Brush your canvas with primer sealer and let dry for 24 hours. Or use a hair dryer to speed up the drying process. If you were doing a full size floorcloth it would be necessary to wait for the dry time of 24 hours. Yours will be much smaller and will dry quicker. So let it dry sufficiently to the touch. Sand the surface and apply one more coat of sealer. Flip over and give the bottom the same treatment. Finishing this side will prevent your colors from bleeding through. Decide on your floorcloth main background color for the finished side. Give your floorcloth 2 (two) good coats of color letting dry and sanding between each coat. Find an appropriate design for your floorcloth. Trace this image onto the surface of the finished side only. Using your imagination choose colors and paint your design onto the floorcloth. Remove anything like masking tape or markers from your design. Apply 2 (two) coats of varnish. Let dry and sand between each coat. Straight edged designs are the easiest. Use masking tape on straight edges and remove just before your design is dry. This technique gives perfect edges. Oil or acrylic paints can be used for variation in designs. Acrylic paints have their simple clean up with soap and water going for them. View or Buy Miniature Kitchen Hutch here. We have supplied the above instructions to help make your floorcloth. Ones that you make yourself will always be original. However the ones featured below will give you ideas as to what a floorcloth looks like in its finished state. As well for you who would like to just purchase a floorcloth then these are your solution. They are very unique with each of their tiny characteristics. We could of course start furnishing a tiny dwelling's particular room with first choosing a floorcloth and buying other things to complement and match it. Matching these floor covers to walls, woodworking ideas, furniture items and various decor featured throughout a room is a great place to begin. One thing though these examples are all done in 1:12 scale. If you were hoping for an addition to a fashion doll's world then you may have to design it yourself. But then that's where the most fun is. Especially if you love the creative end of things. How-to Books for your Growing Woodworking Ideas Knowledge Base...Information is a must-have resource we all need. The more we have the more we know. Check out this page for more woodworking ideas in books. Fine Scale Miniatures for Dollhouses Check out the various scales and information about them. Learn to miniaturize the objects currently around you. Then blend your real world into your mini environment.